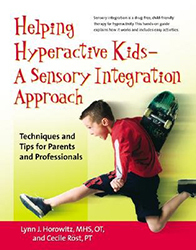 Hyperactive children may have a sensory integration problem that makes it difficult for them to select and respond appropriately to the everyday stimuli or events in their environment. For example, if they have a filtering problem, they may not know whether it is more important to pay attention to the teacher's voice or to the sounds of an airplane. Helping Hyperactive Kids provides sensory integration techniques that can be used immediately to help hyperactive children develop more integrated behavior.